Quality maximising at a great price! An affordable enhancer plugin promising to "make your tracks powerful and more alive", Harmonic Maximizer gives you six discrete frequency bands of 'excitement' to play with, feeding into a maximising limiter with dry/wet mix blend for parallel processing. Fortunately, given the cursory-at-best manual, it's very easy to use. Each band of the Exciter section applies up to 24dB of harmonic saturation to its own adjustable frequency range, between them spanning 20Hz to 12kHz. 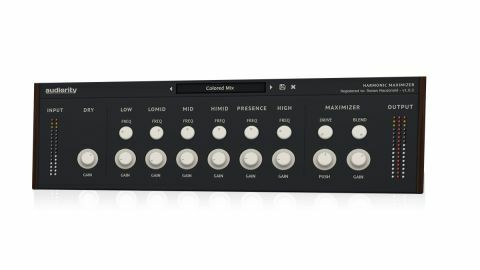 The Maximizer section's Push knob lowers the limiter threshold and increases the make-up gain at the same time, while a pretty convincing overdrive algorithm introduces further, more blatant distortion. stronger settings bring out a crunchier character that needs to be handled with care.